BBQ Dragon Review: What is it? 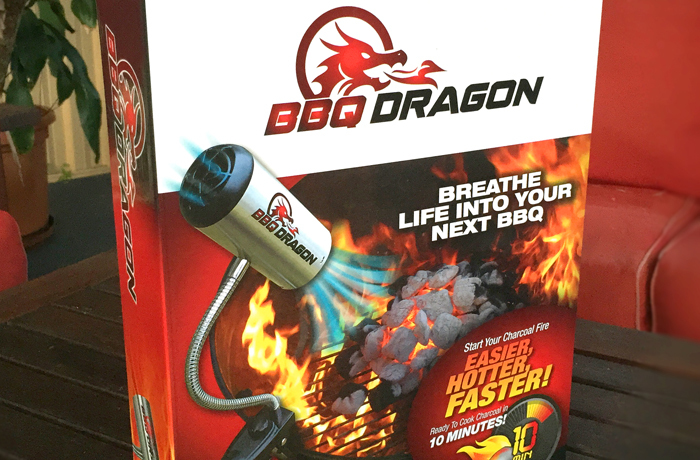 The BBQ Dragon is essentially an electric set of billows: it blows a steady stream of air onto your charcoal, getting them started quicker or rapidly increasing the temperature if it drops mid-cook. 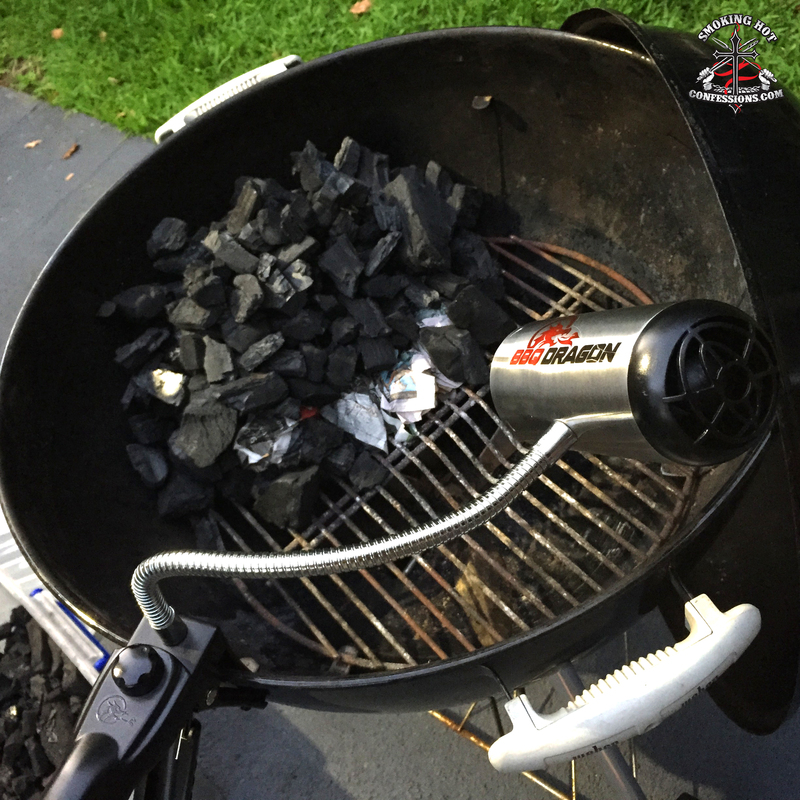 It is battery operated, the fan speed is variable, and it has innumerable mounting options thanks to it’s flexible head and universal heavy duty mounting clip. BBQ Dragon Review: How does it go? I’d heard some internet rumblings about it and once I heard that they were available at the same local hardware chain that I’d gotten my Smash Pizzeria Kit from, I had to check it out. The first thing I noticed was the packaging. It is certainly very well presented and looks like it holds a game-changing product inside. I was convinced just looking at the box, so I handed over my $59.95AUD and took one home. I was immediately impressed by how solidly built the thing felt. The mounting clamp is heavy-duty with a very strong spring that feels like it will stand the test of time. My only concern was the battery clip that was a bit fiddly and brings me to my first concern. The box clearly states that batteries are not included and yet when I opened up the box, there was a set of batteries. At first I thought it was a win for me, but more about that latter: it was time to try it out. I typically start my charcoal with a charcoal chimney but the company videos focussed on lighting a pile of charcoal, so I balled up some newspaper (again, not the way I usually light charcoal), piled some charcoal on top and lit it up. The newspaper just smouldered away and didn’t seem to be doing much so I turned on the BBQ Dragon. This is when I started feeling my expectations being shattered one at a time. 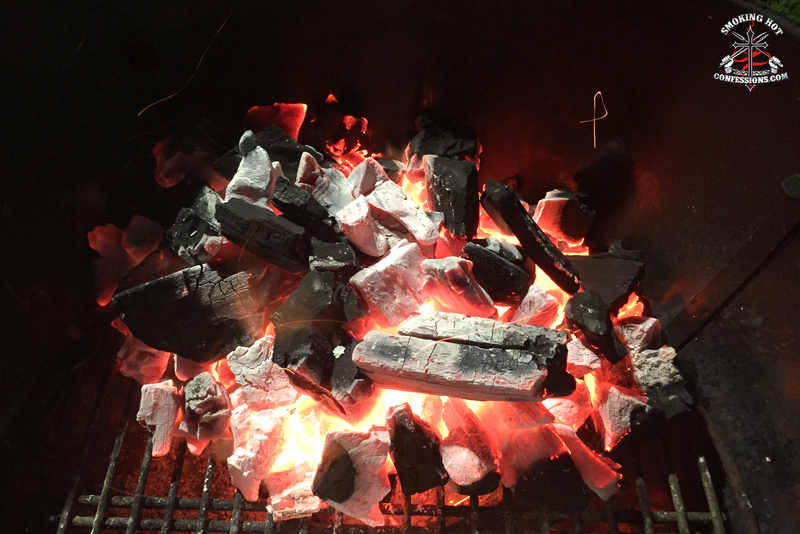 The disappointment continued on into the evening as it took 45 minutes for my coals to be ready to cook on: far outside the 10 minutes advertised on that flashy packaging. By this time the batteries had run almost flat with the BBQ Dragon sounding less like a dragon and more like an 80 year old with emphysema after a lifetime of chasing the dragon! As I was packing up the BBQ Dragon to take it back, a slip of paper fell out on my feet. What was this? Instructions? But I’m a red blooded Aussie male! I don’t need any instructions… However, logic won out and I sat down to read them. Firstly, the batteries are supposed to be rechargeable nickel meta-hydride. The batteries included were not: if you’re going to supply batteries, why supply the wrong ones? Secondly, the instructions clearly state to use firelighters and give them a 2 – 5 minute head start before turning on the BBQ Dragon. I hypothesised that in my eagerness I had turned the BBQ Dragon onto the newspaper too early, burning up the paper too quickly, not getting enough of the charcoal started and that’s why it took so long. With the rage somewhat subsiding, I decided another experiment was in order. This time I followed the instructions to the letter. I got two firelighters, lit them, put a charcoal basket over the top, waited four minutes and turned on the BBQ Dragon, now fitted with the right type of batteries. What a difference! The fan sounded far stronger before. It only took 9 minutes for me to have charcoal ready to go. I’ve used the BBQ Dragon at least a dozen times since and the batteries are showing no signs of slowing down. Finally, coal to cook on! There are a few things to consider when contemplating buying a BBQ Dragon. However, like most things these are design compromises: not having one thing allows you to have something else. 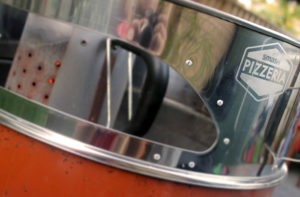 For example, the BBQ Dragon does not have a heating element meaning you still need firelighters to get things started. The upshot of this is that it adds mobility: you don’t need power cables and 240 volts to get your BBQ started which is great if you, like me, enjoy taking your favourite ‘Q into the great outdoors. It will certainly mean no more hands-and-knees blowing on the coals to get your cooking fire ready. Another downside is batteries: if they run out and you don’t have more then you’re out of luck. But again the trade-off is portability and not having to drag cables around – ever tried using an electric whipper snipper? Awful. So what do I like about the BBQ Dragon? Firstly it’s compact which makes it great for taking on trips. It is infinitely applicable thanks to its flexi-head and wide-opening heavy-duty clamp. Despite the lack of a heating element, I love that it’s cordless: I hate dragging out extension cables and then having to pack them away again. With a BBQ Dragon, you'll never have to worry about this again! My feelings are a little mixed on this one. Am I glad that I have it? Yes. Do I happily use it often? Yes. Has it been added to my comp kit? Yes. Would I buy it again? Yes, but I’d be looking for it on special. The price of the BBQ Dragon puts it in the non-essential luxury category: it’s very cool, useful and great to have if you have the coin, but you can get away without it. BBQ Dragon Review: Where to Buy? If you’re in the States, the BBQ Dragon is available on Amazon. There is even a battery charger too. Prices will vary over time. Please note this is an affiliate link, meaning I will get a small commission if you purchase a BBQ Dragon, at no extra cost to you. Thanks in advance! Get your BBQ Dragon now! Below are affiliate links to Amazon – I’ll make a small commission if you purchase a BBQ Dragon via these links, at no extra cost to you! 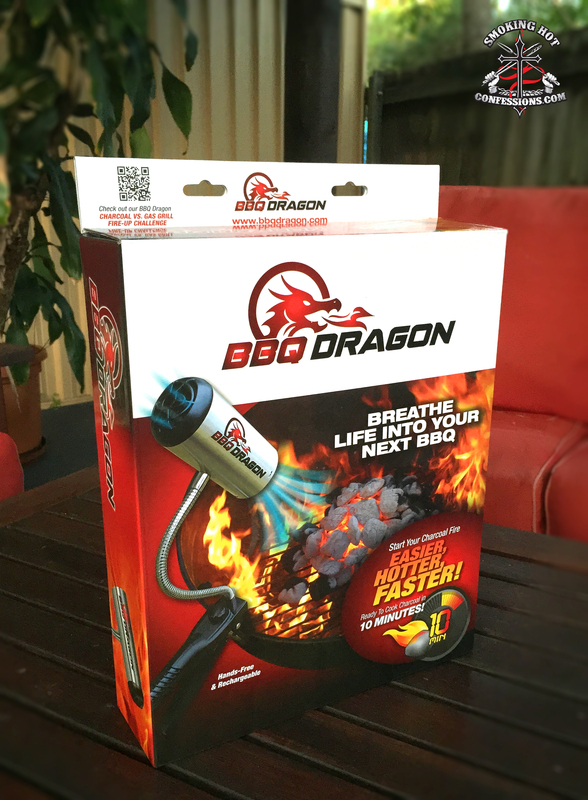 Aussie Readers – Get your BBQ Dragon now! U.S. Readers – Get your BBQ Dragon now! Not a comment but a question.. will it work inside a cold smoker for air movement when you do jerky to help with air movement to dry the jerky. How do I buy the rechargeable battery kit?….I have seen it somewhere and I just got my Dragon today…..
Good question. I’ve done a bit of research and updated the article with a link for where you can find it. Have fun and let me know how you go with it!